Bruce played the song only once with Gary U.S. Bonds. First Springsteen performance on "This Little Girl" and his only known performance on "School Is Out". 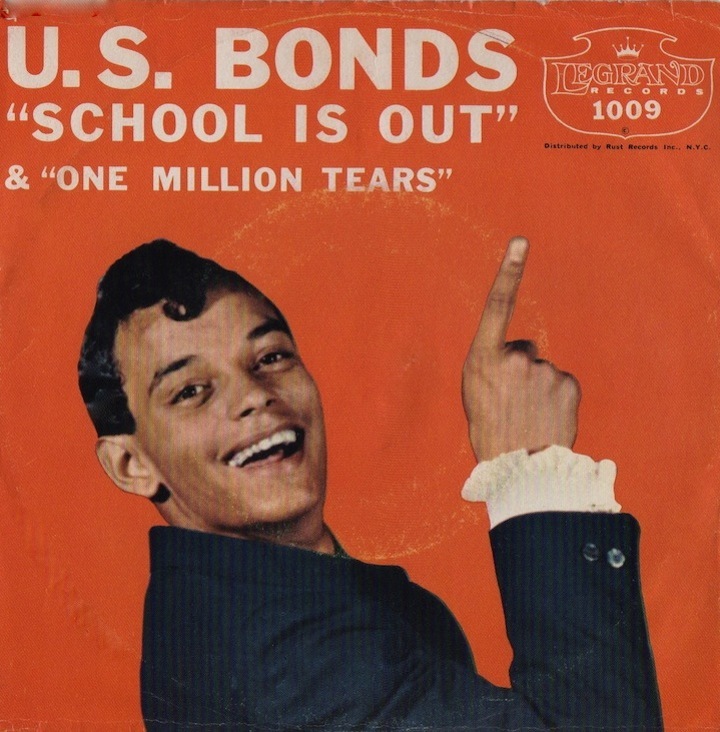 "School is out" is taken from the album ' Dance 'til Quarter to Three ' with U.S. Bonds (1961). "No musician on earth was less cool in 1981 than Gary U.S. Bonds. It had been 20 years since the dance classic "Quarter to Three" fell off the charts and the singer had been largely forgotten. But Bruce Springsteen knew the guy had more life in him, and together with Steve Van Zandt he wrote and produced the LP Dedication for Bonds. It was an amazing labor of love that introduced Bonds to a whole new generation of rock fans. 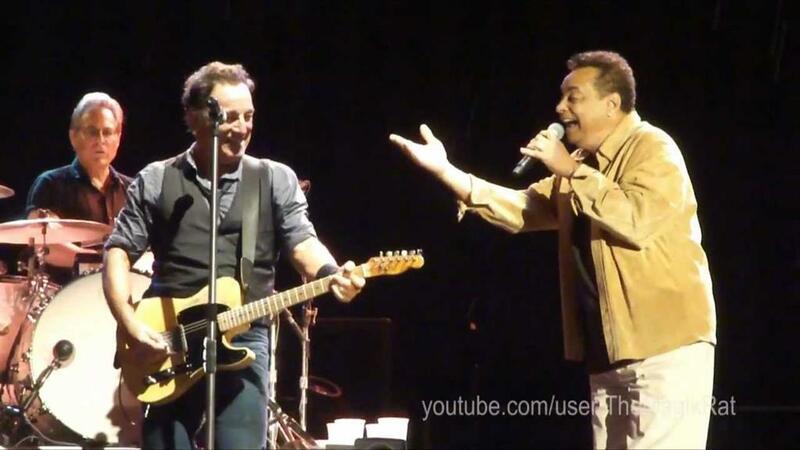 They remain close and in 2012 Bonds sat in with the E Street Band at New Jersey's MetLife Stadium. " Bruce helped Gary U.S.Bonds improving his carrier with producing the album "Dedication" and "On the line". An album released by Gary U.S. Bonds in 1981, the first of two on which he collaborated with Bruce Springsteen & the E Street Band, the second being On the Line, released the following year, 1982. The musicians accompanying Bonds on the album include many members of the E Street Band and the Asbury Jukes.The album includes three songs written by Bruce Springsteen, one written by Steve Van Zandt, and several covers of songs from the Beatles, Bob Dylan, Jackson Browne, and others. 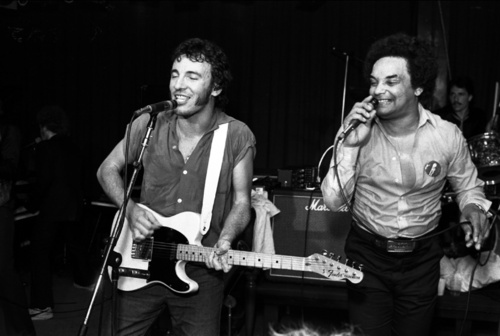 It also features a duet between Bonds and Springsteen on the track "Jole Blon". Bonds' early 1960s sound had been a major influence on both Springsteen and Van Zandt. The songs written by Springsteen, including the cover of "Jole Blon", were originally intended for his 1980 album, The River, but he felt they fitted better with Bonds and his versions of them have never been released although he has performed most of them live, often featuring Bonds as a special guest. The album produced several singles. The Springsteen-penned "This Little Girl" was a major success. The album was re-released in 1994 on the Razor Edge label of Razor & Tie music, and then again in 2009 on BGO Records, paired with On the Line. In a 2016 career retrospective interview with Pods & Sods, Gary revealed that a few additional songs and outtakes recorded during this time may eventually be released. On the Line is an album released by Gary U.S. Bonds in 1982, the second of two on which he collaborated with Bruce Springsteen & the E Street Band, the first being Dedication, released the previous year, 1981. The musicians accompanying Bonds on the album include many members of the E Street Band. The album includes seven songs written by Springsteen, one written by Steven Van Zandt, and two written by Bonds himself . Three other songs were recorded for the album but not present on the final release including Springsteen's "Action In the Street", "Lion's Den", and "Savin' Up". Springsteen's version of "Lion's Den" was eventually released in 1998 on his boxset Tracks and "Savin' Up" appeared on Clarence Clemons' first solo album Rescue (1983); " Springsteen's version of "Rendezvous" was finally released in 1998 on the four-disc box set. Interview with Gary U.S.Bonds about his autobiography : "That's My Story" by Gary U.S. Bonds and Stephen Cooper. I could sing and shout! So everybody come and go with me! We're gonna have a night with Daddy Go Daddy! With a little bit of soul now!